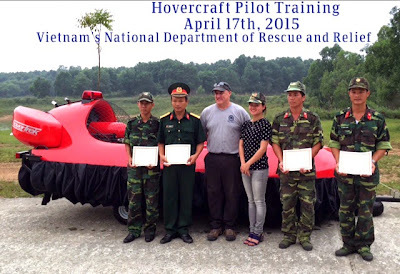 Last year, Hovercraft Training Centers conducted flight training in Hanoi for first responders from the Viet Nam military’s National Department of Rescue and Relief on their two new Neoteric military hovercraft. The Department, under the Ministry of National Defense, coordinates military and non-military forces in search and rescue operations and disaster relief. 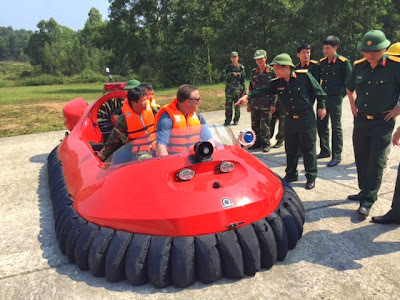 With their four Neoteric hovercraft, and professionally trained military pilots, the People’s Army of Viet Nam is well-prepared to conduct operations that cannot be handled by any other vehicle. The craft are a great asset in a country often plagued by monsoons and floods. Interpreter Thuy Nguyen Thu, Phan Nhat Anh, and Do Xuan Vu.